Honda Cars Philippines, Inc. (HCPI) proudly announces that its automobiles achieved remarkable fuel efficiency during the Department of Energy’s (DOE) first Euro 4 economy run. The said event was conducted to come up with a benchmark to standardize the measurement of fuel economy under the Philippine Energy Standards and Labeling Program (PESLP), a mandatory DOE program requiring manufacturers, importers, and suppliers to comply with the prescribed energy labeling requirements and minimum energy performance standards. HCPI, together with other automotive brands, joined this fuel economy run and participated their eight (8) recently introduced products namely the New City, All-New Civic, New Mobilio, New HR-V, Jazz, CR-V, Brio, and Brio Amaze. The participating brands’ vehicles traversed the 280-kilometer roads from Petron Clark station in Angeles City Pampanga to SCTEX (Subic-Clark-Tarlac Expressway), TPLEX (Tarlac-Pangasinan-La Union-Expressway) and back, with the convoy led by DOE representatives. Before the activity started, all vehicles were lined up and filled to the brim with gasoline and sealed to ensure that none of the participants will be able to load gasoline during the course. The fuel used during the event was sponsored by Petron Corporation, its official gasoline partner. Each vehicle consisted of a driver and a navigator from the participating brand, and a representative from the media that served as an observer to ensure that the guidelines set were being followed. Other rules such as a maximum speed of 80km/L, full blast air conditioner setting and allowable three-second rule or equivalent to five (5) car distance were also strictly implemented. As a result, the Jazz 1.5 VX CVT variant which gathered 28.60km/L has the highest efficiency rating among the Honda entries, and is considered best in class among the subcompact hatchbacks. The All-New Civic 1.5 RS Turbo launched in April 2016 records an impressive 27.56km/L. This Civic’s top-of-the-line variant is treated with RS design sport elements and a DOHC VTEC Turbo Engine under its hood that delivers a maximum torque of 22.0 kg-m at 1,700-5,500 rpm, and a maximum power output of 173 PS at 5,500 rpm. Having an engine equipped with Continuously Variable Transmission (CVT) developed under Earth Dreams Technology, the All-New Civic boasts a powerful driving performance and fuel efficiency. Honda’s best selling model, the New City 1.5 E CVT got 26.02km/L. In an internal fuel economy run conducted in August 2015, the City also recorded the same level of fuel efficiency from combined city and highway driving from Metro Manila to Pangasinan. This proves the City’s consistent and realistic fuel efficiency in different road and traffic conditions. Furthermore, equally important in Honda’s model line-up, the New Mobilio 1.5 V CVT achieved a figure of 24.69km/L, considered the best in the compact MPV gasoline category; and the New HR-V 1.8 E CVT with 24.82km/L, the best in crossover SUV category. 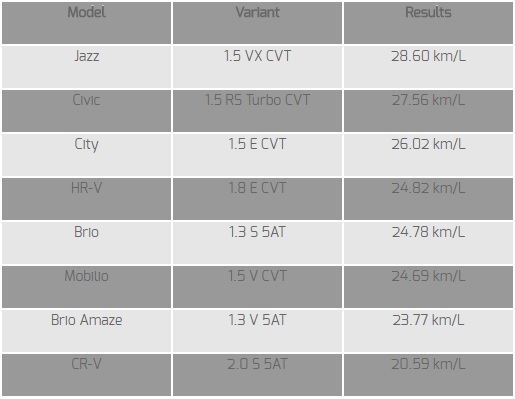 On the other hand, the CR-V 2.0 S AT with 20.59km/L, Brio 1.3 S 5AT with 24.78km/L, and the Brio Amaze with 23.77km/L also achieved good fuel efficiency results. As early as 2004, HCPI started introducing EURO 4 ready products in the Philippines. By September 2015, HCPI was first among automotive brands to obtain EURO 4 certification from the Department of Environment and Natural Resources (DENR) for its locally manufactured and imported vehicles. 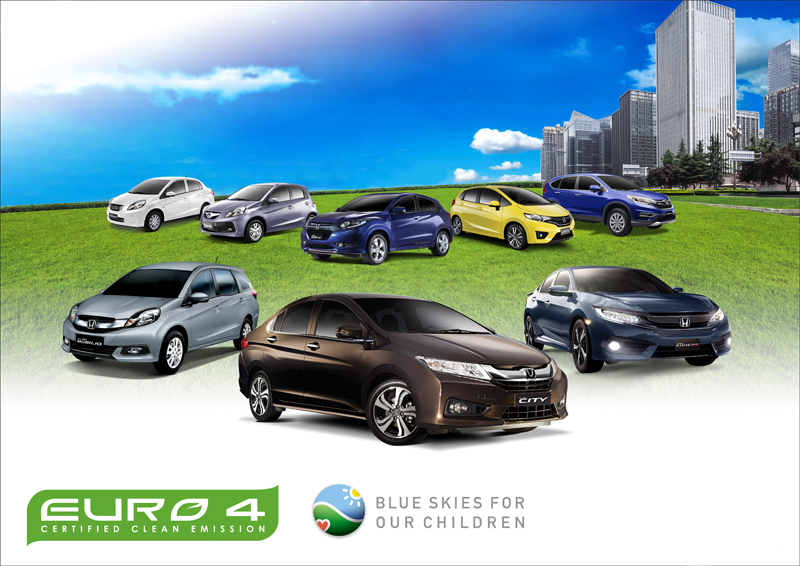 As stated by HCPI President and General Manager, Toshio Kuwahara, “It has always been one of HCPI’s thrusts to leave blue skies for our children, which is why Honda products are produced with the most consideration on the environment and its users. Moreover, in the midst of the increasing fuel costs, Honda believes that the new technologies and advancements in its engines promotes fuel efficiency and help its consumers save on resources for other essential commodities”.